Family offices are unlike institutional investment groups when it comes to recruitment. They often place more emphasis on loyalty than any other thing. This makes sense because loyalty helps to negate frictions that can arise between differing expectations of the goals of the owners (principals) and employees (agents) at a private investment group. When you combine loyalty with professional excellence you create the ultimate family office employee. Their professionalism helps to ensure performance and their loyalty helps to engender trust. These individuals are the consiglieres of the family office world and they are arguably some of the most powerful people in the world of family capital as they help to steer trillions of dollars of investments globally. All of them have worked at least 10 years for the family office. Often their careers have straddled both the operational business of the family and their investment office, or they were hired to set up the family’s investment office. Their loyalty often means many of them are in their sixties. 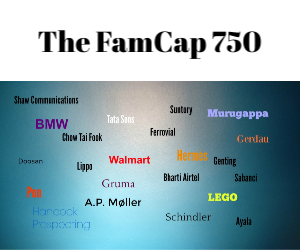 But all of them function at the top of their game – they are Family Capital’s Consigliere 25.